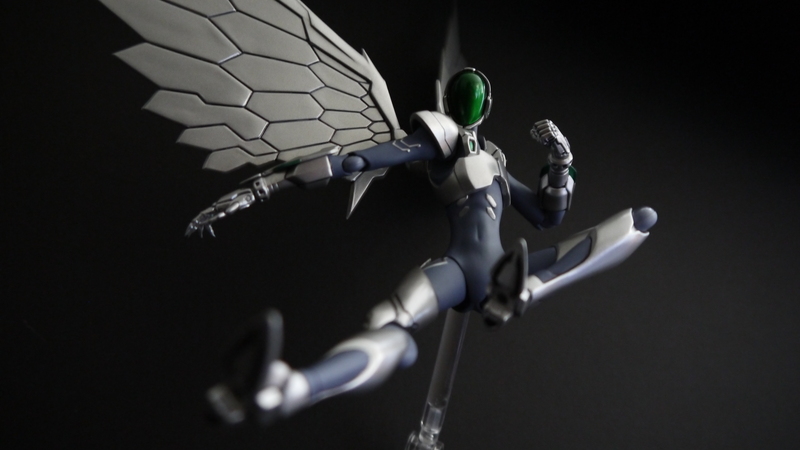 Hailing from the rather recent and popular anime Accel World, Silver Crow’s been the subject of a whole mess of figure releases, from a Figurese model kit to a S.H. Figuarts. The Silver Crow model kit was a tempting buy at first, but after looking at a few pictures of it raw out of the box, I figure it’d be more worthwhile to simply wait for the Figma release. 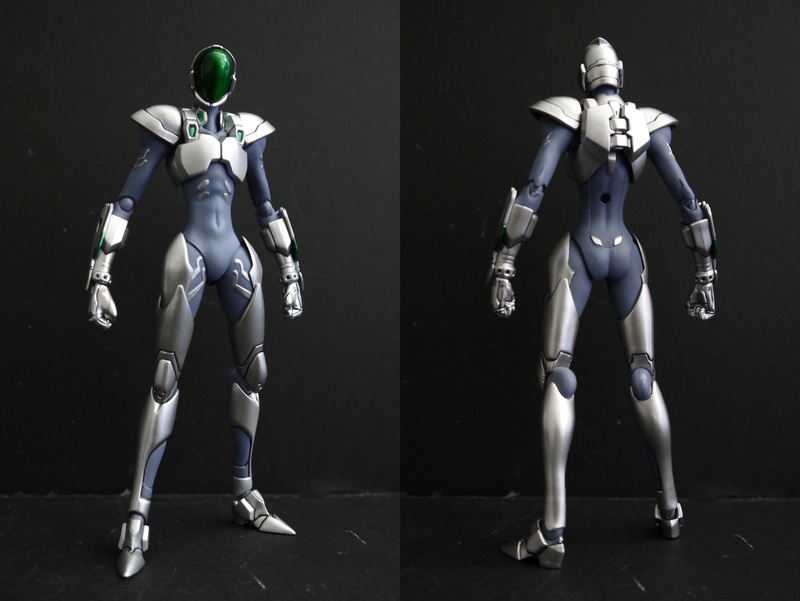 While the Figma itself is a very tiny package and Silver Crow himself is rather…thin, you really do get what you pay for. The Figma gets all the design elements and colors from the anime down to the letter; everything looked gorgeous out of the box; joints are solid, paint is well done, no major defects. My only slight nit-pick is that I had to go back and fill in all the black panel lines myself, though that’s more out of personal taste rather than a production qualm. The finished figure looks fantastic, despite being so small. The silver paint used on this figure is really brought out when it catches the light. Everything stands out brightly and beautifully. Naturally, Silver Crow wouldn’t be Silver Crow without those gorgeous giant silver wings. The original plate that goes over the wing sockets is included, and the wings themselves peg into each socket in the back individually. There are several joints at the base of the wings to allow for pretty much omnidirectional movement. 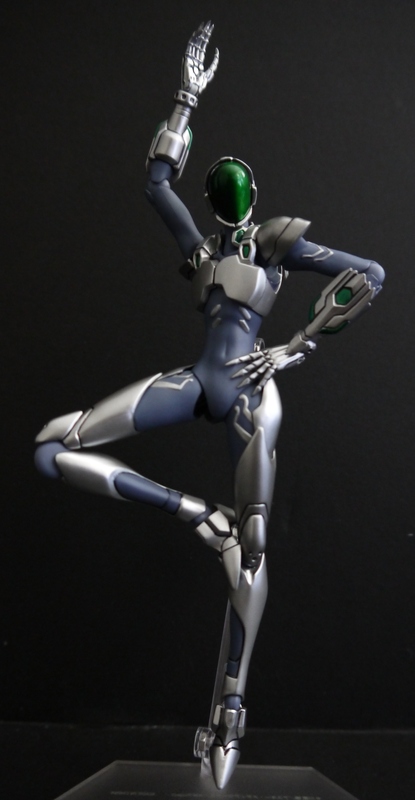 Articulation is fantastic enough to allow for successful replication of Silver Crow’s All or Nothing Kick!! The bottom of the feet are even detailed…the included stand is standard Figma fare, though it comes with one extra clear pole arm to put the figure higher in the air. Used well when the wings are deployed. Included are some frosty clear white beam effect parts to replicate the Incarnate System. You get two effect parts that go on the side of the arm, and the tip of the blade that goes over the hand. While the armor plates on the forearm don’t actually open up to allow this gimmick, Max Factory gives you two spare forearms with the emitters activated, to be swapped out to show the effect. A small gripe with this is that the effect parts don’t really peg into anything, per se. They’re more or less held on loosely by friction, and while I could see an attempt at putting the side pieces on pegs under the forearm emitters, it doesn’t work out quite well. Slight movement could knock them loose. I’d like to point out now that Silver Crow’s articulation is pretty darn impressive…not because it’s limbs can stretch the extra inch or anything, but mostly due to its simple, unobstructed character design in general, that allows it to pull off some crazy things. Something I was particularly impressed by was the seamless torso movement; Max Factory designed it so that the upper chest can move side to side, replacing the lack of actual waist articulation but maintaining the same effect. As with most Figma, you get a rather large selection of spare hands. Besides the standard closed fist, you get a holding hand, the ninja-chop Incarnation hand, open palm, and I’m-grasping-for-something hand. I find it interesting how a pair of accessory holding hands seems to be a must-have for all Figmas, even if there’s nothing to hold. 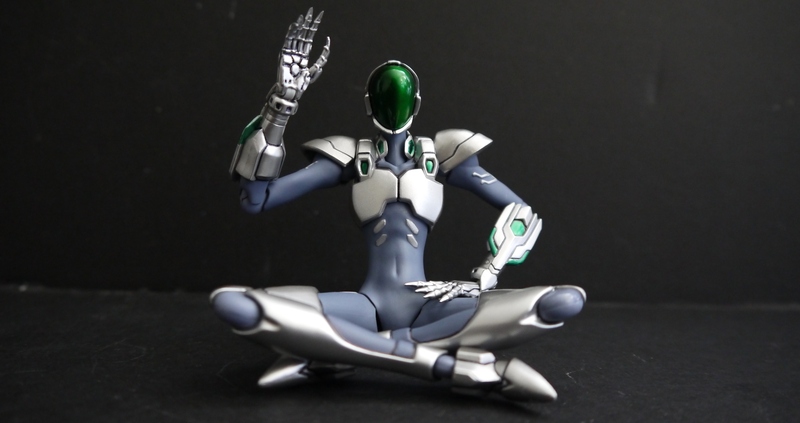 All in all Silver Crow is a fantastic addition to the Figma line-up; while it may seem like a rather small package, you do get a whole mess of worthwhile accessories. The paint scheme and general sculpt in general is fantastically done. Can’t really say there’s anything to complain about; it’s just a great little figure!